By every measure, last year was an unequivocal success. In addition to providing medical exams and forensic interviews to 460 children, we offered support to hundreds of additional parents with concerns about their kids. Through our “Stewards of Children” training and other prevention-oriented initiatives, we taught thousands of adults how to recognize and respond to the signs of sexual abuse. And we began preparing to launch a new therapy program intended to help children and their caregivers overcome the trauma of abuse — addressing the County’s most significant gap in mental health services. In the face of continued flat government and insurance funding, our generous donors enabled us to finish well ahead of budget, with income exceeding expenses by more than $125,000. 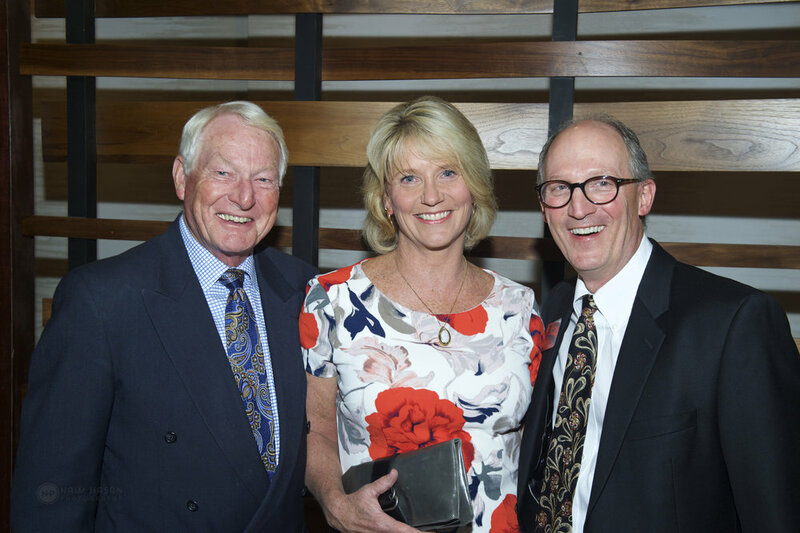 Both of our signature events (the Healing Garden Gala in the Fall and Children’s Center Honors in the Spring) were attended by more than 400 friends. In conjunction with Children’s Center Honors, Oregon Public Broadcasting aired a fascinating hour-long panel discussion, featuring keynote speaker, Dr. Nadine Burke Harris, and six other local experts, including the Center’s Medical Examiner Supervisor, Dr. Sue Skinner. And we started laying the groundwork for a “Community Conversation” that envisions a County where abuse no longer exists. 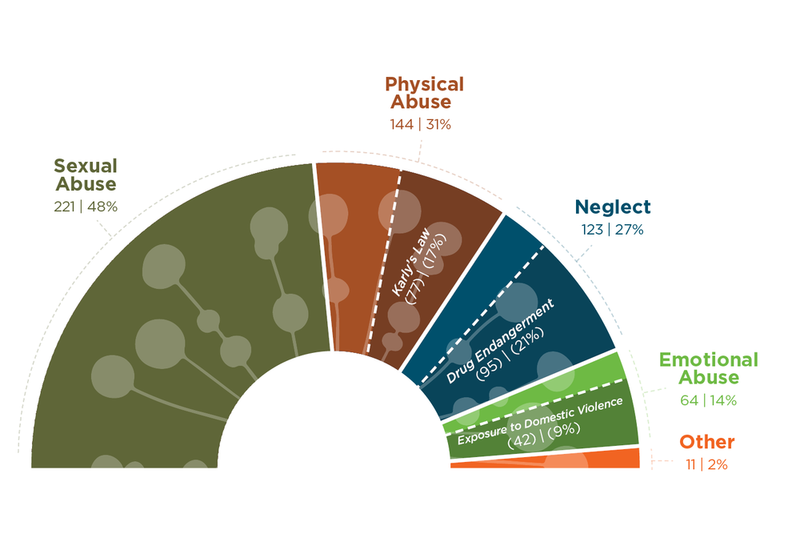 In short, we’re gaining considerable momentum in our efforts to intervene, treat, and prevent child abuse and neglect. By responding to the challenge comprehensively — and engaging the entire community — we’re establishing Children’s Center as not only a regional treatment leader, but a thought leader as well. Most importantly, at a time when negativity and divisiveness dominate media headlines, we’re building bridges and fostering hope. While our mission transcends politics, our values invite dialogue and civility. We’re proud to share the fruits of our progress with you — and grateful for your partnership in this important work. Together, let’s continue planting trees under whose shade our children and grandchildren will someday sit —safely and securely. Medical providers at Children’s Center are specifically trained in evaluating children when there are concerns for abuse and neglect. These examinations are comprehensive head-to-toe exams aimed at evaluating a child’s health and wellbeing. Medical providers may also perform or order testing for the child, such as urine testing, hair testing, or x-rays. As the providers at the center are trauma-informed, considerations are made to ensure that a child is comfortable and has control of his/her exam and body. At Children’s Center, specially trained forensic interviewers provide developmentally-appropriate interviews for children in a safe and neutral environment. The interviews are digitally recorded and observed by child protective services and law enforcement at the Center. Our family support team can help caregivers understand how this experience will impact the child and what adults can do to help the child cope and recover. Family Support Specialists are Master’s level clinicians who offer emotional support, education and referrals to resources in the community for ongoing services. Family support services are available to any concerned caregiver, even if the child is not seen in the clinic for a full assessment. RISK was established to provide support, education, resources and intervention to children eleven years and younger who demonstrate sexually inappropriate behavior. Children’s Center contacts families in these cases with a goal of addressing the behaviors before they escalate to a level that necessitates juvenile justice involvement. Each year, Children’s Center conducts medical assessments and interviews for Clackamas County children who are suspected victims of abuse and neglect, as well as providing resources, referrals, or other support to families. Children’s Center is a trusted source for information and referrals related to child abuse intervention and prevention. The Center’s clinical staff regularly fields inquiries from community members, parents, medical and education professionals, and referring partners or agencies seeking advice or access to resources for a variety of child safety concerns. Children’s Center is the designated medical provider for Clackamas County. Children must be seen within 48 hours when injuries are suspected to be the result of physical abuse. Because of this, the Center maintains a number of open appointment times in order to accommodate these urgent assessments. Referrals exceed the total number of assessments because many children are referred for multiple concerns. In partnership with The Ford Family Foundation’s Protect Our Children statewide program, Children’s Center is working to end child sexual abuse in Clackamas County by offering Darkness to Light’s research-informed Stewards of Children® prevention training. This nationally-recognized workshop teaches adults five practical steps to help prevent, recognize, and respond responsibly to sexual abuse. As a leader within our county’s state-mandated multidisciplinary team, we offer presentations and trainings designed to help professionals from law enforcement, child welfare, schools, medicine, mental health, and social services serve an effective role in preventing and addressing child maltreatment. Our medical, mental health, and prevention specialists support schools, parent, mentor and volunteer groups by providing presentations and trainings on the impact of trauma on children and adults, the signs and symptoms of abuse, services and programs of Children’s Center. Individuals who received a presentation, training or consultation from our teams of physicians, nurse practitioners, forensic interviewers, mental health providers, educators, and trained volunteers. Not much is harder for parents, teachers, coaches, and anyone who supervises children than disciplining them. It’s a tricky, touchy subject. But if we’re serious about building a better world for kids, we need to examine how we help them manage their behavior. Most Americans believe that physical punishment is acceptable — despite compelling evidence to the contrary. Studies reveal that physical punishment is harmful to children physically, emotionally, psychologically, and socially. Additionally, when parents are angry, they can fail to understand their own strength and level of arousal — which makes it easier for physical punishment to enter the realm of physical abuse. By the time a teenager gets to the Children’s Center, Interviewer Supervisor Sue Lewis said, they typically are ready to talk about what happened, but they may have faced many challenges to get to that point. Lewis said teen girls often first talk about the abuse with their friends, rather than their parents. Then, those friends might keep the secret, not wanting to violate their friend’s trust. Lewis said teenage boys face different barriers. The sexuality piece is a big concern, with many boys worrying about a stigma of being presumed gay. In 1998, researchers from the CDC and Kaiser-Permanente put out a groundbreaking study. They catalogued a variety of what they called ACEs. It stands for “Adverse Childhood Experiences.” ACEs included things like sexual or physical abuse, or living in a home with domestic violence or substance abuse. The researchers found that the more ACEs someone has, the higher the chance of all kinds of negative health outcomes — from heart disease to cancer to mental illness. 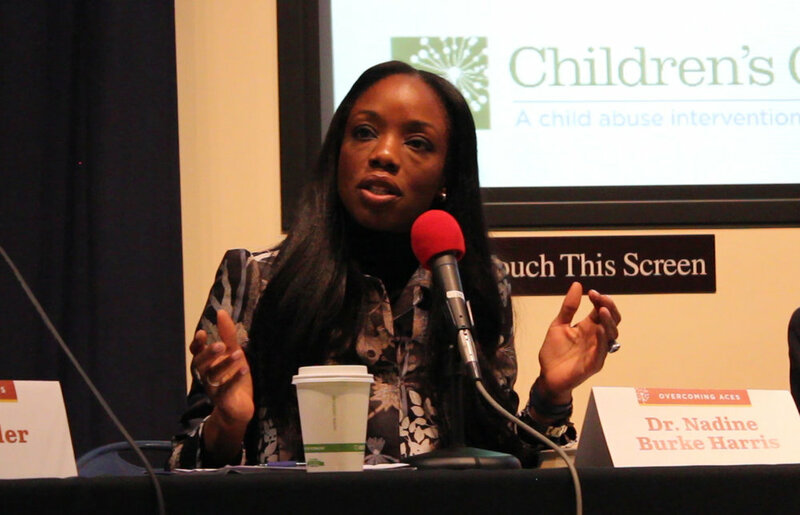 Children’s Center worked with Oregon Public Broadcasting to air an hour-long panel discussion featuring Children’s Center Honors keynote speaker and ACEs expert, Nadine Burke Harris. who supported Children’s Center this year! We imagine an Oregon where no child has to bear the burden of abuse. Our Monthly Champions step up for kids by generously giving each month. Thank you to our loyal supporters for making it possible for Children's Center to serve hundreds of children and families in Clackamas County this year! Honoring our community of supporters, partners and advocates, please view our list of in-kind gifts made in 2018. 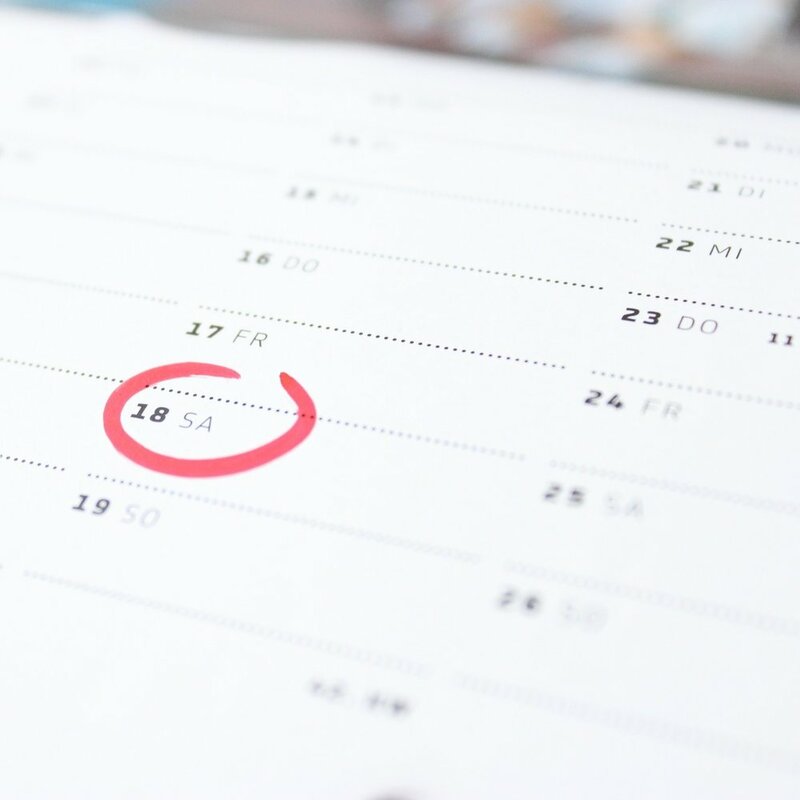 Throughout the year, community volunteers assist various departments with special projects, ranging from ongoing service to being available on an “as-needed” basis. Children’s Center hosts and participates in several signature events every year – spearheaded by committee advocates who work tirelessly with our staff, community partners, and a take a lead role in the coordination and planning of an event, while supporting our mission to protect kids and prevent child abuse in Clackamas County. This type of service is invaluable to staff and Children’s Center is deeply appreciative of their efforts! Children's Center is the place families can come and hope to change the story. Learn more about the vital work we do to help support kids and families on their journey towards healing from abuse or neglect. 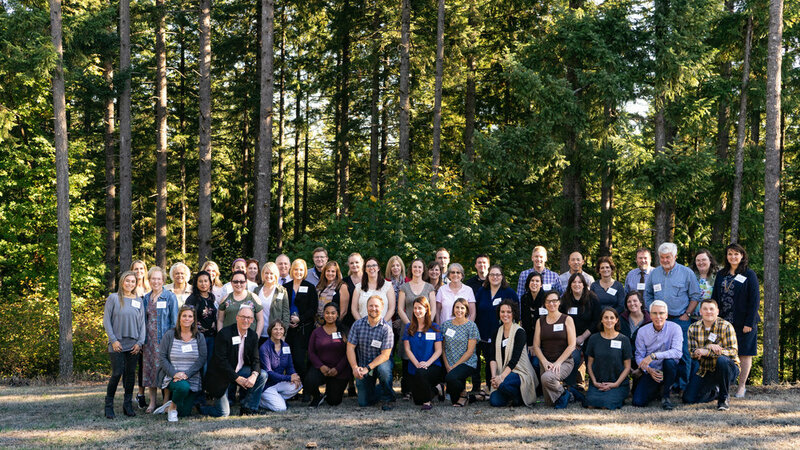 The first phase in our Community Conversation was hosting a design retreat, where hand-selected community members came together to design how we can work together to end child abuse in Clackamas County by 2050. Interviewer Amanda McVay, Jennifer Spencer-liams, and Liliana Will participate in the Design Retreat. Arielle Crist, a Community Mental Health Therapist at A Village for One, presents to attendees.